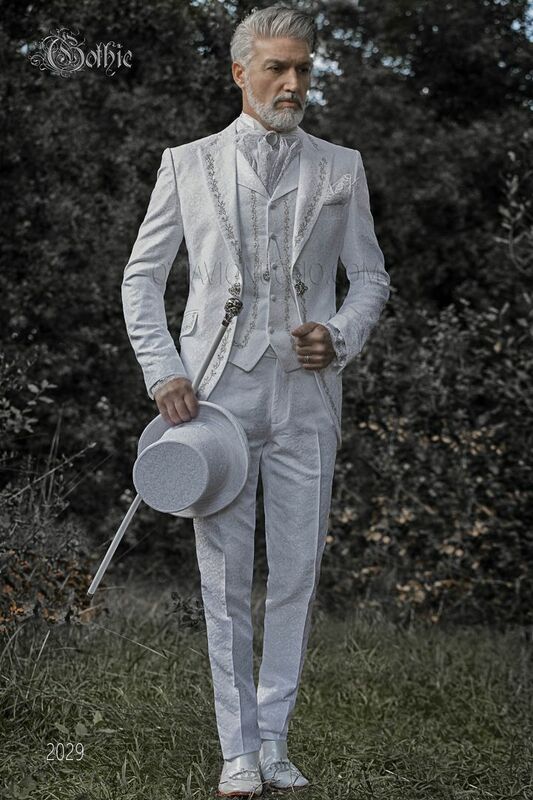 White jacquard brocade italian bespoke groom suit with silver embroidery on the front side and the back side. Peak lapel... White jacquard brocade italian bespoke groom suit with silver embroidery on the front side and the back side. Peak lapel, one vent at back, Redingote-style seams and rhinestone frog closure. White lace plastron tie with silver-tone lurex crochet trims and matching handkerchief. Handmade. Nickel-tone cravat clasp. Mother-of-pearl effect cameo and clear rhinestones.